It’s amazing that I used to hide my cabbage under my mashed potatoes and now I’m eating mini cabbages and think they are FANTASTIC! Then again, I think bacon makes everything better. So does Cooking Light. 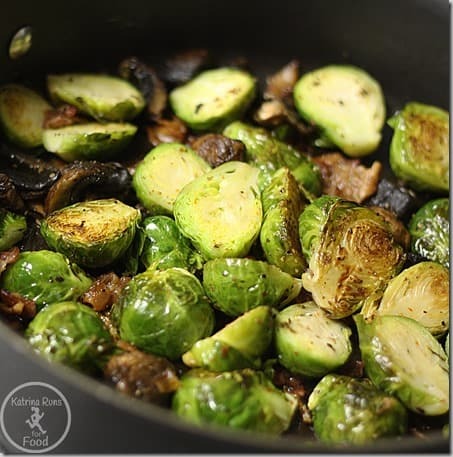 This recipe is without a doubt the best recipe I’ve tried with roasting Brussels sprouts. The sprouts still have a crisp bite to them without being soggy or that overdone boiled taste. The bacon, garlic, and shallots only make the them better. This is great addition to my growing list of vegetable sides without grains or gluten. 1. Heat a large nonstick skillet over medium-high heat. Add bacon, and sauté for 5 minutes or until bacon begins to brown. Remove pan from heat. Remove the bacon from pan with a slotted spoon, reserving 1 tablespoon drippings in pan (discard the remaining drippings). Return pan to medium-high heat, and stir in bacon, shallot, and Brussels sprouts; sauté 4 minutes. Add garlic, and saute for 4 minutes or until garlic begins to brown, stirring frequently. Add the chicken broth, and bring to a boil. Cook for 2 minutes or until the broth mostly evaporates and the sprouts are crisp-tender, stirring occasionally. This sounds good and will try the shallots. This is a version I make you may find tasty. Brussel sprouts roasted with garlic and cooking red wine sherry ( or something similar). Saute 1 Tbsp minced garlic in 1 Tbsp EVOO in a pan ( I really like garlic so may add more on most days). Steam 2 cups brussel sprouts, then cut in half with a scissors( makes it easier) and add to pan. Add 2 Tbsp. cooking red wine sherry and let it ‘roast’ until sprouts start to carmelize. Adding asparagus or mushrooms is divine! 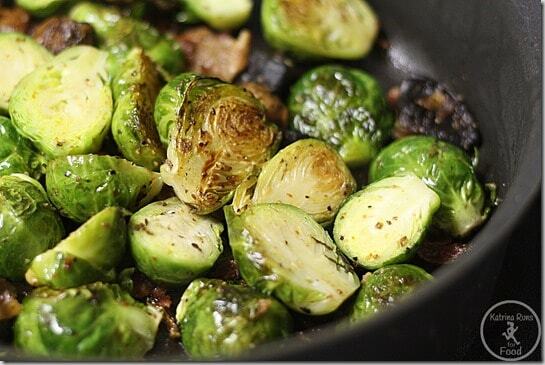 Mmm, nothing pairs better together than brussel sprouts and bacon (except maybe chocolate and peanut butter!). This looks so good. I love the caramelization on them. The bacon really makes a difference. I wouldn’t sit down and eat a plate of plain boiled sprouts. Add bacon and the sprouts are like a different food.